First, I'd like to wish you all a very very happy Ganesh Chaturthi / Pillaiyar Chaturthi! Ganapati is Lord of all Ganas! Pillai means son, and Pillaiyar is calling Him with respect. He is one of the simplest deities who can be approached without any fear, and one of the Six main deities who can liberate His devotee and make him one with Himself. Ganesha is found everywhere, esp in Tamil Nadu. Find a Arasa Maram (Peepal Tree) and you can find one nice fat Ganesha sitting below! He is absolutely easy to please - Just offer Him some arugam pul (a type of grass) - He gets ecstatic when he gets Kozhukkatai (Modhakam). We just have to remember is that He is just a kid with elephant's face. Just a mere sight or thought of Ganapathi should help us lose our sorrow and make us feel light and happy. But, behind His child-like demeanor lies one of the Supreme Personalities of Divinity. He is One with the Parabrahman Himself. He is called 'Vinayaka' - Vi-Nayaka - One without Leader / Hero, because there is none superior to Him. His Body is a reflection of Om / Pranavam - He is One with OM. He is always invoked first before any effort to remove all the obstacles! When Bhandasuran, a nasty Asura created massive obstacles, Sri Lalitha (consort of Shiva) looked at Shiva, and Lord Ganesha jumped out from the Union of their sights. He removed all obstacles, and finally lead to triumph of Devi over Bhandasuran. When Lord Shiva wanted to burn the Tripura (owned by Three Asuras), He forgot to invoke Ganesha. As a result, the axle of His chariot broke. Shiva then realized His folly and created a clay idol of Ganesha and worshipped. He then successfully proceeded to destroy Tripura. 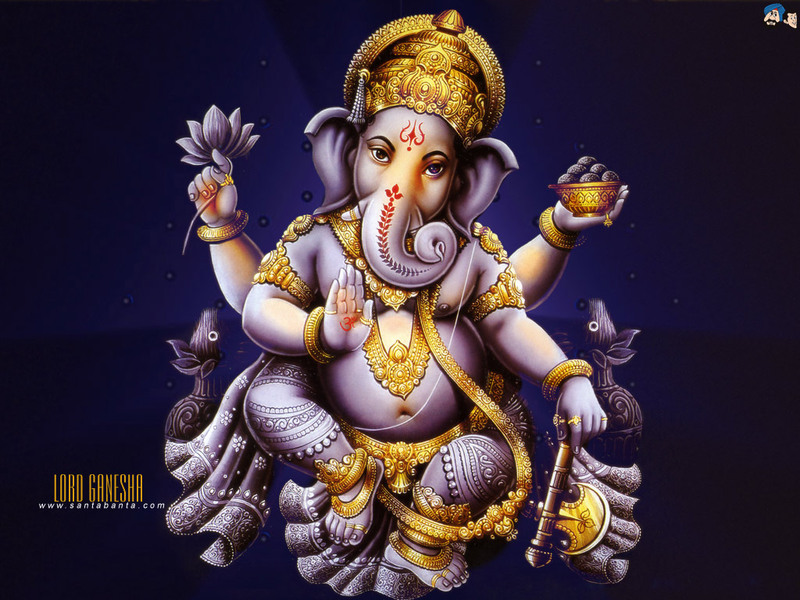 When Lord of the Lords Himself invoked Ganesha, we should always invoke Him. 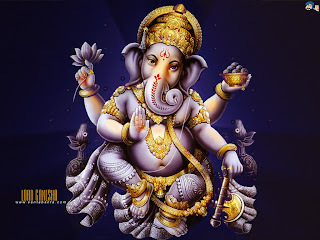 We should start our days with remembering Ganesha. Let us medidate on the pleasing face of Sri Ganesha, who wears white dress, all pervading, colored like the moon and Has four-hands, upon which all the obstacles are removed! Let's start all our activities with this Shloka! May Lord Ganesha shower us with His Grace! PS:- In the image above, He is neither shuklambharadharam or shashi varnam :-) - Just liked this image! After being delinquent from blogging duties :) due to unending work pressure, I thought I should make some time to continue the Vishnu Sahasranamam Series – Afterall, today we celebrate the birthday of one of the Highest Form of Divinity to have descended to human-accessible levels – Bhagawan Sri Krishna, who is Paramatman, Himself! In the initial part of Sri Vishnu Sahasranamam, Sri Bhishma tells that the Supreme Person for whom the Thousand Names are addressed is standing right next to him! 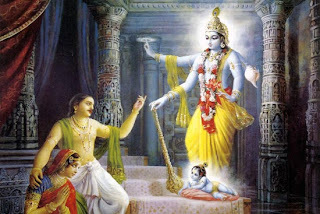 Krishna was a Purna Avataram – That is he came with unrestricted glory – For e.g., Sri Rama had to confine Himself to the capabilities of a human. But, with Krishna, there was no such thing! He killed monsters when he was a baby, danced on a snake, lifted mountains, gave liberation to devotees and what not! In Vedas, lot of Karma (actions / duties) are prescribed – For e.g., Nitya Karmas (that need to be performed daily) like Sandhya Vandanam, and others like Yajnas, Homams etc – When we make mistakes while performing those Karmas, then we have to do Prayahschitta Karmas – To make amends for the mistakes. But, what do we do when we make mistakes while doing the Prayahschitta karmas? There is no end to the loop! So, Vedas say, the only way to stop this is by chanting ‘Krishna’ 12 times! That’s it! Krishna can be adored as a baby, cherished as a friend, revered as a Master, prayed to as a God, loved like a spouse and what not! There is no restriction whatsoever to pray to Krishna – He is the most accessible one, who comes running on calling His name! Benefits of chanting entire Vishnu Sahasranamam, can be acquired by chanting the name of Sri Krishna alone! (1) Ma-Sucha: - Do not Fear! (2) Yoga-Kshemam-Vahamyaham – I’ll bring unto you what you don’t have and protect what you have! (3) Sambhavami Yuge Yuge – I’ll come down in every Yuga! Let us remember His Words, and follow His advice. May all of us be fortunate enough to seek the blessings of Bhagawan Sri Krishna!